OUR CANADIAN MARITIME ADVENTURE BEGINS! 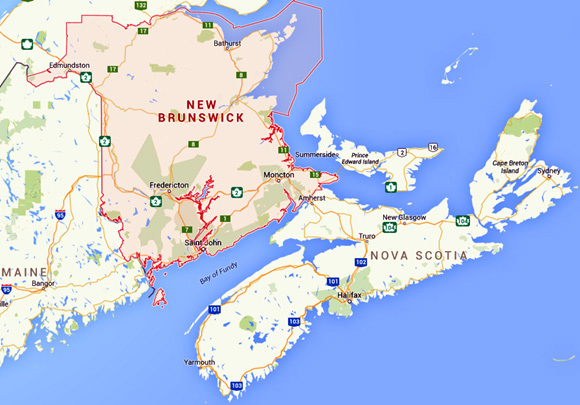 on three sides, New Brunswick has literally been shaped by the sea." Our Maritime Adventure has begun! We love to travel to interesting new places. When we made the decision in June after closing on our house in Virginia to head north and east in search of cooler temperatures instead of going out to the Rockies again, I studied my AAA maps and began plotting different routes to include some of our favorite places in New England as well as some new ones. I couldn't help but notice how close the three Canadian Maritime provinces are to Maine. Nova Scotia has always intrigued me, so I suggested we go there, too. As usual, our travel plans have morphed since we began researching things to do and see in the Maritimes. When we return to favorite places, we usually know where we want to camp and what activities we want to do. When we go somewhere new, we aren't so sure. The anticipation and uncertainty are part of the fun! Our route through New Brunswick (NB), Nova Scotia (NS), and Prince Edward Island (PEI) is a work in progress. Depending on the weather, we'll probably spend about a month exploring those provinces, concentrating this time on NS and PEI. We briefly considered traveling to Newfoundland but gave up that idea when we saw how long and expensive it'd be to get there by ferry with a 36-foot 5th-wheel coach. Not this time. Ditto for traveling across the Bay of Fundy between NB and NS via ferry. We won't save any money by driving the long way around the bay, and it will definitely take longer, but we'll get to see more of the landscape and how people live. Jim suggested visiting Cape Breton Island in Nova Scotia first, since it's the farthest north and the most mountainous. We don't know how fast cold weather comes to this part of the world. 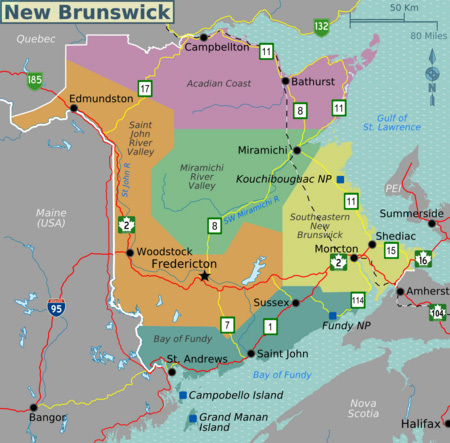 We'll head south through mainland Nova Scotia from there, then a little farther north and west to Prince Edward Island. We have to drive through southern NB to get to both NS and PEI. We'll see a few sights there along the way out and back. Whether to make campground reservations ahead of time is always a dilemma for us when we're traveling somewhere that is new to us. Reservations limit our flexibility but reduce some of the uncertainty and stress. The past few days while we were in New Hampshire we researched campgrounds and decided to make reservations at five locations in the Maritimes. This is a popular vacation area in August for both residents and visitors from around the world and we didn't want to have problems finding places to stay on weekends and Labor Day. We're in Moncton, NB now for three nights. We'll spend several days exploring Cape Breton Island from Baddeck, NS, several days in the Halifax, NS area, a few more days on Digby Neck, NS, on the Bay of Fundy, then a week in central PEI in early September. We'll do day trips to nearby areas from each of those locations instead of moving the camper every day or two. Depending on the weather and other factors, we might do more exploration in NB on the way back to the States. Jim also did a lot of research to figure out insurance, monetary, phone, internet, and other issues during the weeks we're in Canada. Vehicle insurance and emergency road service aren't a problem; our coverage with Blue Sky, Coach Net, and USAA work OK in Canada. Health insurance is an issue, though. We discovered that Medicare and Tricare won't cover us in the Maritimes so we bought a relatively inexpensive medical policy from USAA for 30 days. They offered a better deal than Good Sam and other companies Jim contacted. If we stay in Canada longer than a month, we can extend the coverage. We changed our Verizon phone plan while we're in Canada and suspended our personal MiFi internet service until we get back to the U.S. It costs more than we want to pay to use it out of the country. We'll use public WiFi for e-mail, news, etc. and avoid any online financial transactions while we're in Canada. Jim found a good way to avoid the 3% exchange fee to use our credit cards in Canada -- we can get Canadian cash from ATM machines at no extra charge (no conversion or ATM fees) with one of our cards. We usually pay for most everything with credit cards and pay them off at the end of the month. While we're in Canada we'll just get money from ATMs as needed and pay for everything with cash. The exchange rate is in our favor this summer; we're paying less in U.S. money than what the Canadian costs are for campgrounds, fuel, food, etc. We became familiar with Canadian cash two years ago when we went to Alaska. The smallest coin is the nickel, which makes sense -- no pennies. One's and two's are coins, not paper bills, also quite sensible. Their paper money has changed in the last two years. Now the bills have a cool translucent section in the middle to make counterfeiting more difficult. A shopkeeper told us the new bills often stick together, though, so we're careful to separate them when paying for something. We also notified the banks where we have credit cards that we'll be traveling to Canada, in case we decide to use those cards instead of cash. We always let the banks know when we're on the move from state to state so they will know if someone is using our cards fraudulently. Yesterday we drove east from Twin Mountain, NH to Calais, ME, which is right across the Canadian border from St. Stephen, New Brunswick. 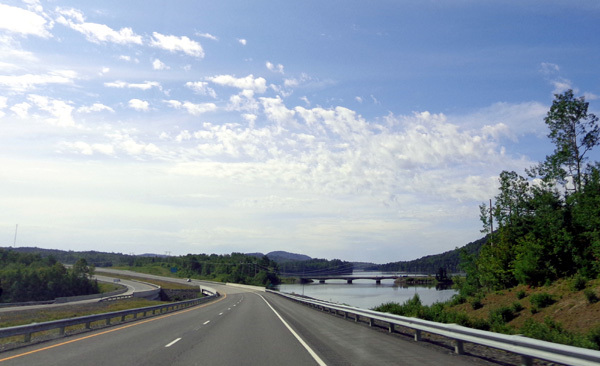 Most of that drive was on two-lane state and federal highways: US 3 and ME 115 to US 2 to Bangor, then ME 9 to Calais (pronounced CAL-lous, not like the French Cal-LAY). 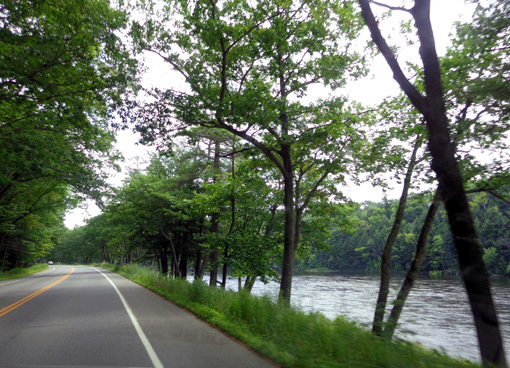 Some of the roads were rough but the scenery was beautiful, especially through the more mountainous parts of eastern NH and western ME. We crossed numerous creeks and rivers and saw lots of wetlands and "ponds" -- lakes to those of us from other states. 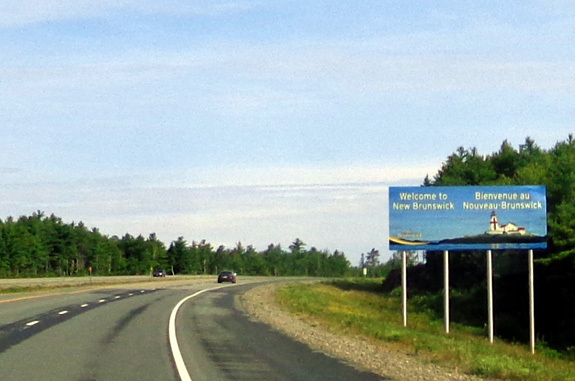 This morning we crossed the border and continued driving on CA 1 and 2 to Camper's City RV Park in Moncton, New Brunswick. CA 1 and 2 are federal highways that are both in excellent condition considering how far north they are and how much truck traffic they get. Traffic was a little heavier today because we traveled through more populated areas than we did n Maine. 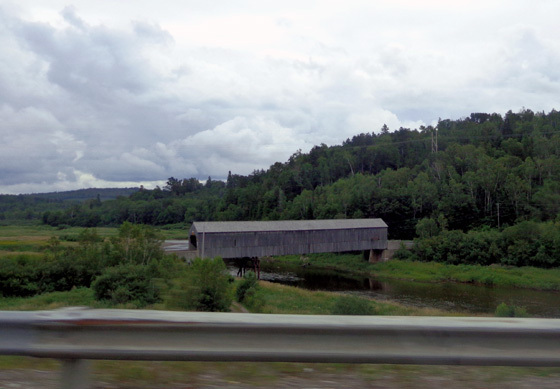 The scenery through southern NB was also nice, despite another partly overcast day. 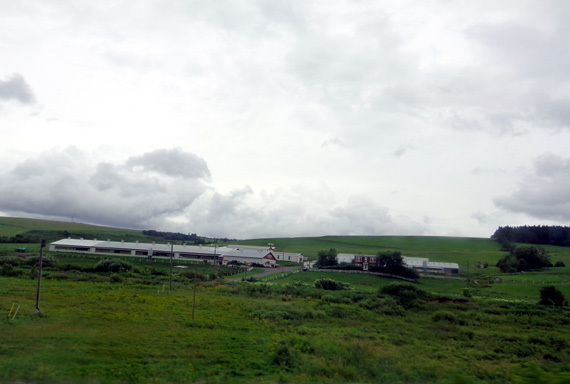 We had some views of the Bay of Fundy to the south and drove past lush green farms and forests. That sort of made up for the aggravation of the border crossing . . .
We apparently lucked out when we went to Alaska in 2012. 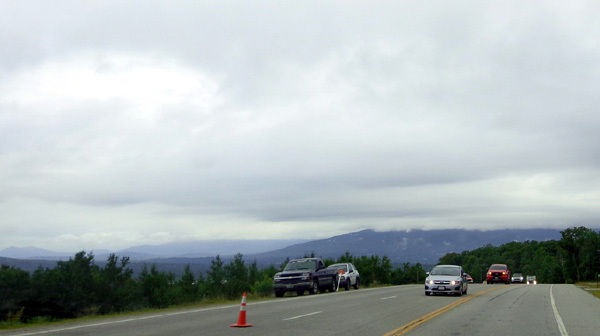 All four border crossings in Montana/Alberta and Alaska/Yukon were uneventful -- answer several expected questions and on our way with absolutely no hassles other than a long wait to enter Alaska on the outbound. This time we were less stressed about the crossing into New Brunswick from Calais, ME. Been there, done that. We had all our ducks in a row -- passports, vehicle registration and insurance, dog paperwork, prescription drugs, foods and alcoholic beverages allowed, etc. Should be a breeze, eh? 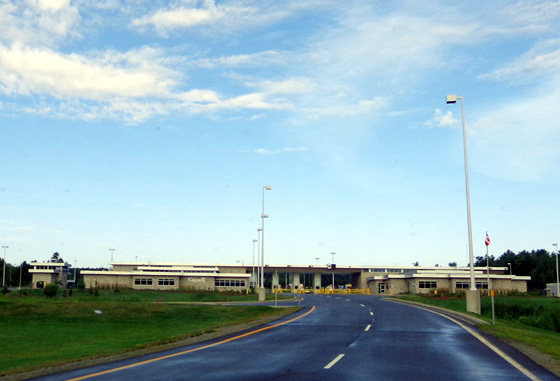 There are two places to cross the border from Calais, ME to St. Stephens, NB. Both are major portals between the two countries. Based on information from one of the American RVers we met at Walmart last night, we chose to go through the newer, larger crossing just outside town rather than the older one that goes directly into the small town of St. Stephens with its narrow streets. That didn't work out so well for us. Even though we were the only one going through customs when we arrived this morning, we were chosen for a lengthy search. Dammit. We don't know why. Jim answered all the questions honestly and with due respect (you don't joke around with customs agents from either country). We figured the agents were bored, curious, needed the training, and/or had a quota to fill. I think it was random bad luck. Later another RVer who frequently travels through this checkpoint because his wife and her family are from Nova Scotia told us there is "bad blood" between the American and Canadian agents at this checkpoint so they deliberately hassle each other's citizens. I don't know if that's true but we definitely felt hassled for no good reason. Initially the young inspector asked lots of the usual questions after looking at our passports -- where we live, where we work, where we're going, how long we'll be in Canada, do we have campground reservations, do we have any food, plants, or pets, do we have more than $10,000 on us, do we plan to sell anything in Canada, do we have any firearms, mace, or pepper spray, and a couple other questions I can't remember. He didn't ask to see our vehicle registrations, proof of insurance, drivers' licenses, dog vaccination records, nor ask about prescription or other drugs. He gave Jim a piece of paper and told us to park the camper farther ahead while we went inside to talk to someone else. Huh? We figured it was to pay duty on the alcohol we declared. Per the Canadian government website, visitors are allowed 1500 ml of wine (two regular bottles) or 24 cans/bottles of beer. We figured with two adults we met that standard -- one too many bottles of wine but only half the amount of beer allowed. The guy inside agreed that if that's what we actually had, we were OK. He also wanted to know every state we've lived in since age 18 and whether we've ever been arrested for anything -- never got those questions at customs before. He took about ten minutes checking all the states' records (he said) and came up with nothing. Despite our clean records, he still said our RV and truck would be inspected. Talk about overkill. We felt violated but cooperated fully. You have to. It was even worse than the feeling of exposure we felt when our house was for sale. We opened the three slides, moved the bikes (we travel with them inside the camper), opened all the cupboards and drawers that have latches or locks to keep things from falling out while we're in transit, and stayed outside while two other young men looked under the bed, in the closets, refrigerator, and drawers/cupboards, and in just one of the basement doors (not all of them). 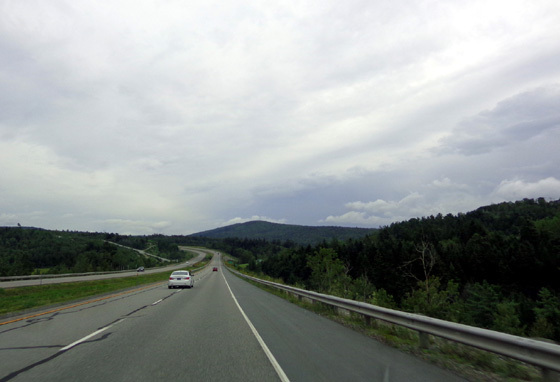 Lush forests surround part of the highway through New Brunswick; logging is big in this province. Apparently all the produce, dairy products, and chicken/fish we had were OK. No food we're carrying was confiscated or questioned. The agents did ask about the two potted plants we have with us -- rosemary for cooking and a decorative plant I used when staging our house for sale. Did we read about the things we could take through customs?? I said yes, but didn't see anything about plants. Then they asked if we plan to take them back to the U.S. with us. Yes. They said plants in soil cannot be planted or left in Canada. I assured him I planned to take both of them back to the U.S. To my surprise, they let me keep them. Then they asked us to take the dogs out of the truck so they could inspect it, too. One guy petted both dogs after they were done. Just about everybody loves Labs. Guess the agents are human after all . . . They asked one last time about firearms and ammo, as if we'd hidden them somewhere they couldn't find. We assured them more than once that we left them in our storage unit in Virginia after selling our house. By then the two guys were a little more friendly, asking us if we were runners. They remarked that they found only 10 cans of beer, not 12 as Jim had declared. They handed us our passports, reminded us to put everything back in order inside the camper before we left (that took several minutes), and wished us well on our journey. Yeah, right. Welcome to Canada!! Guess we should be grateful they didn't trash the place, a complaint we've heard from other RVers. Why us? Why were we chosen for an inspection this thorough?? We are not suspicious characters, just two Olde Pharts traveling in a nice RV and planning to spend a month's worth of tourist money in your country. You shouldn't be alienating us like this! Jim answered all the first custom agent's questions quickly and honestly but all four agents seemed to focus on how much alcohol we had and and whether we were carrying weapons. Perhaps something showed up on Jim's record re: registering his rifles and/or handgun many years ago? Fortunately, we were less irritated and more smitten with New Brunswick by the time we arrived at our campground in Moncton this afternoon. We couldn't let a bad experience at the border ruin the potential for a wonderful trek through the Maritimes. Breathe deeply and move on . 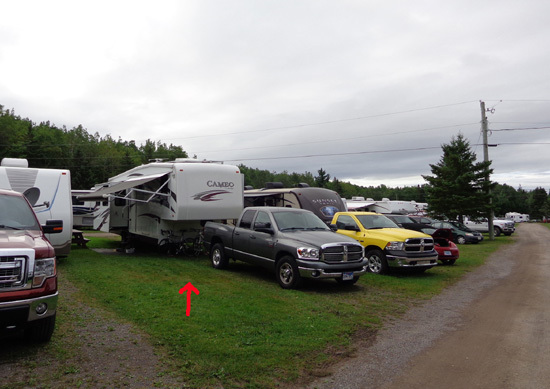 . .
Our only mistake in choosing this campground sight-unseen was reserving a 30-amp site rather than a more spacious 50-amp site. The cost savings weren't worth being as crowded as we were in our pull-through site. The campground is easy to find just off the freeway and up a hill, far from traffic noise but within easy driving distance to Costco, a super-Walmart, PetSmart, and other popular stores. Canada has plenty of its own chains but also many of the ones with which we are familiar in the U.S. 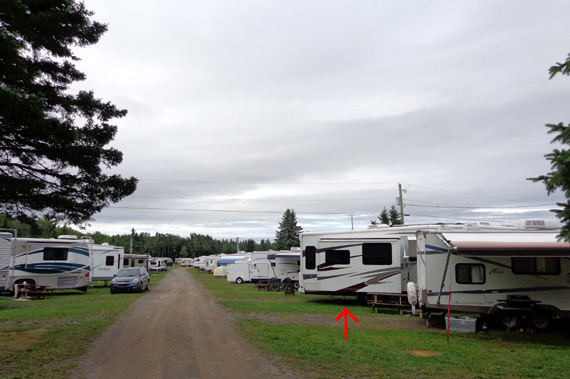 Camper's City is a gated RV park with about 200 spaces. About a quarter are seasonal. The sites are flat, with gravel pads and grass on either side. Sites in the full-hookup 30-amp rows are tight but we do have room to put out all of our slides and the awning. Most of the RV and tent sites were occupied on Friday and Saturday nights; we had a little more room to breathe on Sunday after most of our neighbors went home. 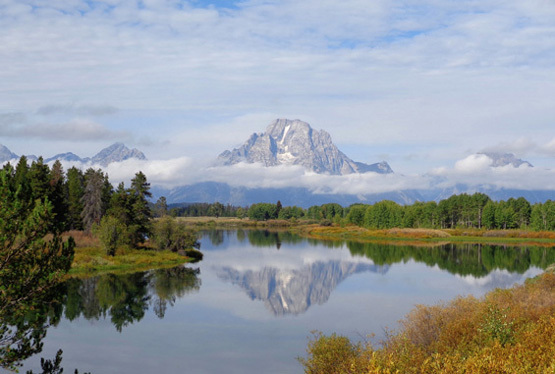 The cost is $109 U.S. for three nights, including 14% Canadian tax and a 10% Good Sam discount. If we stay here on the way back we'll get a larger 50-amp site for a few more $$$. Internet service from Tengo, a third party, is an additional $5 U.S. per day. The campground has a swimming pool, volleyball court, kids' playgrounds, fenced-in duck pond, small fenced dog area, and a maze of dirt trails through the adjacent woods where I could walk the dogs.